Quilt and sham arrived in excellent condition, with colors more vibrant than shown. I washed these with half cup of vinegar and mild detergent. I wish there was a better "hand" to the fabric. It feels on the stiff side and doesn't have enough weight to drape well. However, I plan to use these for a summer weight quilt, so can accept this quilt for what it is and the main reason I purchased it - the COLOR! The bright colors give me joy, and for very little money, I was able to buy two sets of sheets, a bright canary yellow and a shocking pink, to really get that delightful summer vibe. 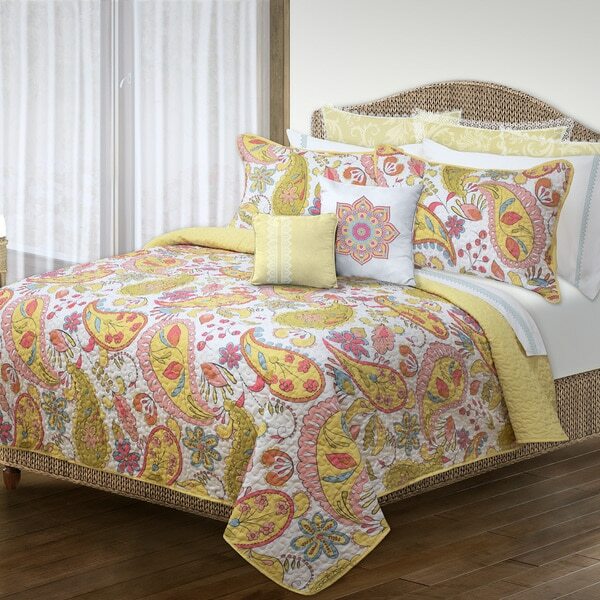 A classic bedroom refresher, this charming quilt set is made of polyester microfiber and features a groovy yellow and pink paisley pattern. The soft, sturdy stitched padding gives this set a resilient and longlasting plush feel that's sure to provide a touch of boho-chic charm for years to come. This is a great quilt set. It was purchased for a small guest room that had paneling on one wall which made the room seem ever smaller. While I entertained painting the paneling, I chose to go with brightening the room another way and this was PERFECT. Colors are so vibrant that it adds a cheery feel to the room and it brightened the room. This quilt also washed very well!! I bought this as a gift for my mom. It looks awesome on her bed. I like to do my own decorating so i purchase different shams and pit them all together. I bought this for my daughter’s room and we both love it. It washes well and gives just enough warmth for the summer months. True to color also. this is decent quality but wouldn't say excellent. 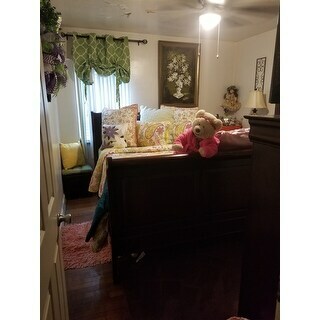 it brightened up guest room for grandkids but doubt it would last real long with everyday use and frequent washings.